The main attraction of the Assassin's Creed: Brotherhood collector's edition is far from the average behind-the-scenes DVD. Assassin's Creed: Brotherhood, Ezio's journey into Rome with the addition of interesting multiplayer elements, will bring many people joy this holiday season. For those that receive the game's collector's edition, it'll also bring a lot of fright due to a just-revealed creepy inclusion. The Assassin's Creed: Brotherhood collector's edition will include two exclusive single-player maps, a strategy map of Rome, an art book, and a bonus DVD with making-of features. Sounds pretty normal right? Did I mention the oh my god it's creepy Jack-in-the-Box? Oh, right, that's included too. Gamestop gets an exclusive Jack-in-the-Box containing Brotherhood's Harlequin multiplayer character, which will pop out while duel-wielding knives. Other retailers get the Doctor Jack-in-the-Box, which just has a creepy mask and syringe. If you're trying to stop a child from sleeping at night, you can't go wrong with either version. Sadly, both Jack-in-the-Boxes appear to open with keys, instead of the classic, fun crank turn. At the same time, I'm kind of glad these characters are locked up because I know they won't be able to get out should they come to life. 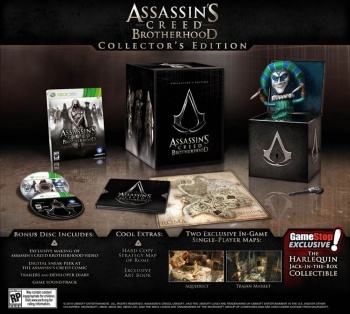 The Assassin's Creed: Brotherhood collector's edition will be released on November 16 and retail for $99.99.